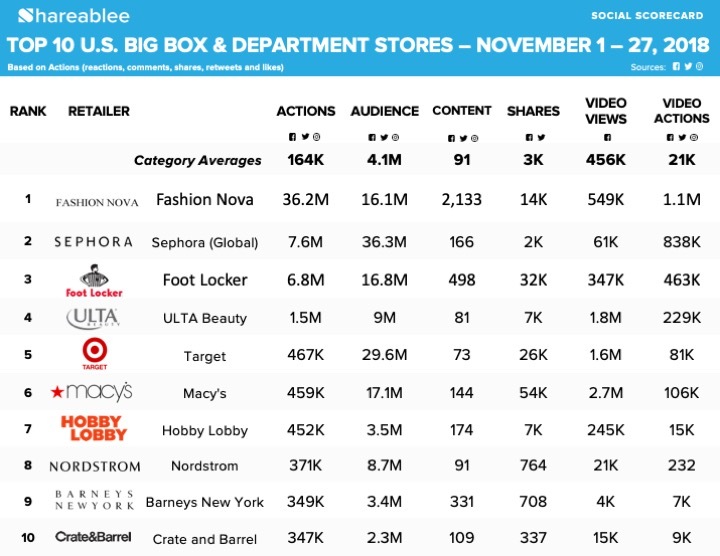 NEW YORK, November 28, 2018	(Newswire.com) - Shareablee Inc., the global leader in audience-based social media measurement, today released Black Friday and Cyber Monday editions of their social media scorecards, ranking consumer interest in U.S. retailers as the biggest shopping season of the year arrives. The rankings reflect a total of 372 million interactions across retail, social media on Facebook, Twitter, and Instagram this November up to Cyber Monday. 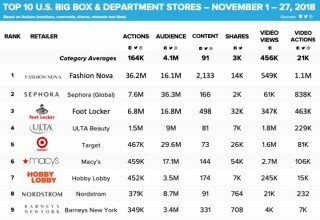 Fashion Nova won the big box and department category for the cyber shopping weekend, earning 36.2 million actions (reactions, comments, shares, retweets, favorites) across Facebook, Twitter, and Instagram. They were followed by Sephora (7.6 million actions) and Foot Locker (6.8 million actions). QVC had the highest video views with 9.6 million, followed by Macy’s (2.7 million) and ULTA (1.8 million). 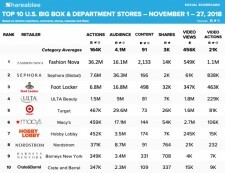 Macy’s had the highest consumer engagement on Twitter with 239 thousand actions, while QVC had the highest consumer engagement on Facebook with 215 thousand actions. Target rose into this year’s top ten rankings with 265 percent cross-platform growth. 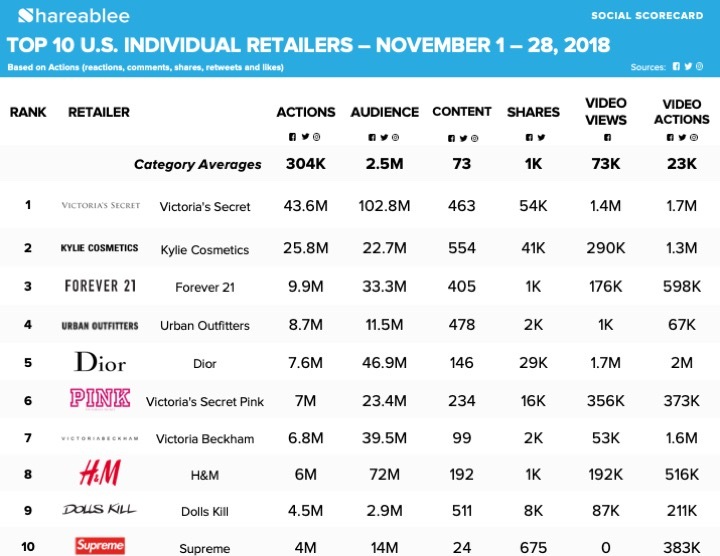 Victoria’s Secret topped this year’s individual retailer cyber shopping weekend list with 43.5 million total cross-platform actions, followed by Kylie Cosmetics (25.8 million actions) and Forever 21 (9.9 million actions). 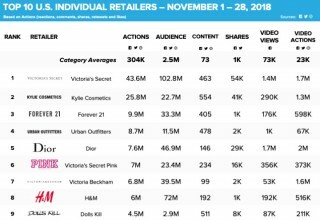 Dior led the video category with 1.7 million views and 2 million actions, followed by Victoria’s Secret (1.4 million views and 1.7 million actions). Supreme posted an impressive 167 thousand actions per post with just 24 total pieces of cross-platform content. Kylie Cosmetics was the most active, posting 554 pieces of content up through the cyber shopping weekend.